An activity from a joint event held by St. Olaf and Carleton Colleges, as part of the 28 Days of Food, Frisbee, and Feminism event series in 2018. Photo courtesy of Tulsa Douglas. Throughout the upcoming month, ultimate communities across the world will host gatherings large and small as part of 28 Days of Food, Frisbee, and Feminism. The February campaign encourages people involved with the sport to meet in person to discuss and take steps to address social and cultural issues that affect their ultimate communities. In its first year, over 700 people participated in nearly 30 distinct events, and if the 2019 edition continues to see similar success, it will be a testament to the strength of a larger movement that started three years ago. When the summer Olympics were in full swing in 2016, inspiring female athletes were everywhere in the media. Simone Biles, Katie Ledecky, and many others dominated headlines, as well as Facebook and Twitter feeds. The sheer volume of women-centric content, and the resulting widespread excitement about women in sport, provided an empowering glimpse into the possibilities of a media landscape focused on raising the profile of female athletes. As the events in Rio winded down, ultimate organizers Tiina Booth and Tulsa Douglas wondered how they could help keep up coverage and continue to consume media about women in sports. The answer was creating 99 Days of Ultimate Women, a social media experiment to create awareness not just of women in ultimate, but “ultimate women” across a variety of sports, backgrounds, and roles. The online initiative provided a welcoming space for dialogue about the successes of female athletes as well as the barriers they face in athletic settings. 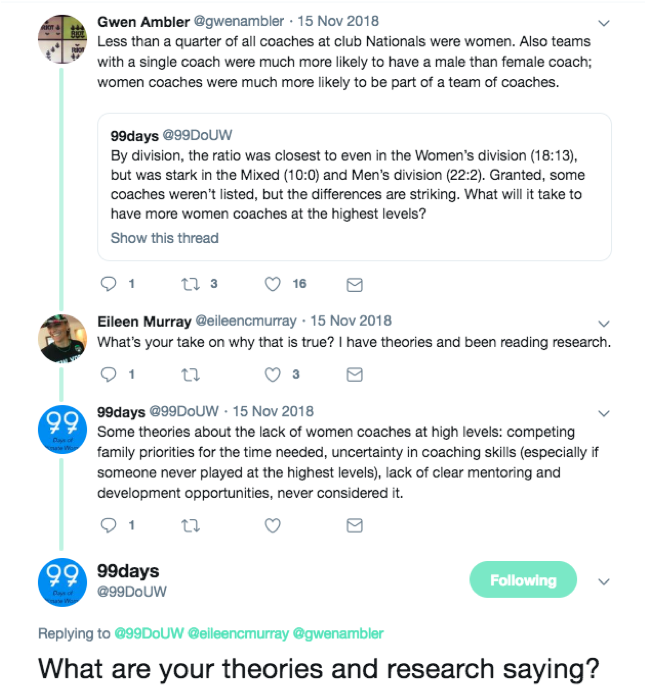 A snapshot of a discussion via the 99 Days Of Ultimate Women Twitter account. The above conversation, which resulted from a 99 Days post about the lack of female coaches at the 2018 Club Championships, is now typical of the social media campaign, which completed its third iteration late last year. 99 Days is run solely online, with a Facebook, Twitter, and Instagram account being taken over by a new person each week for 99 days (the 2018 event ran from September through mid-December) to share stories and issues surrounding women in sport. In 2018, content on all three platforms spanned a wide variety of topics that were both specific to the ultimate community—such as how to make Spirit of the Game more inclusive in an international context—and touched on social and cultural issues that go beyond ultimate. By discussing challenging content, account runners not only inspire followers to make the ultimate community more supportive of all participants, but also highlight their personal stories so that others might see their own realities reflected and have a space for dialogue with athletes with similar experiences. With the movement geared toward helping people consider how to create more equitable systems (especially in our current political climate), Minnesota-based player and ultimate organizer Chip Chang, in the last week of the 99 Days campaign, shared a reading list on anti-blackness and discussed how whiteness affects an individual’s experiences in sport. In one thread, Chip engaged with high schooler Grace Conerly (@being_ulti in the below thread) regarding talking to teammates about race after Grace expressed interest in an article Chip shared on Asian American minority experiences. 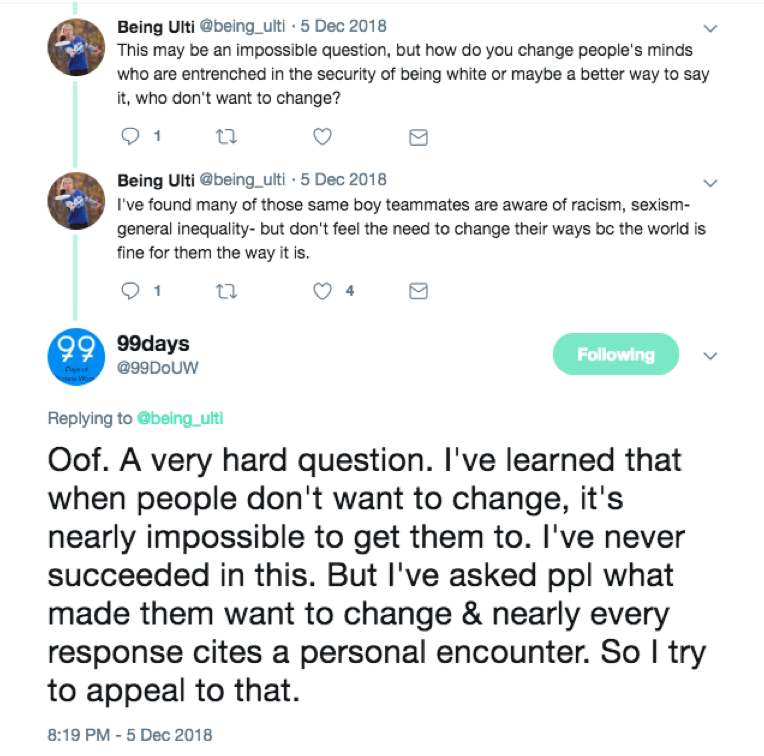 Chip Chang’s (as 99 Days) discussion with youth player Grace Conerly (as BeingUlti). 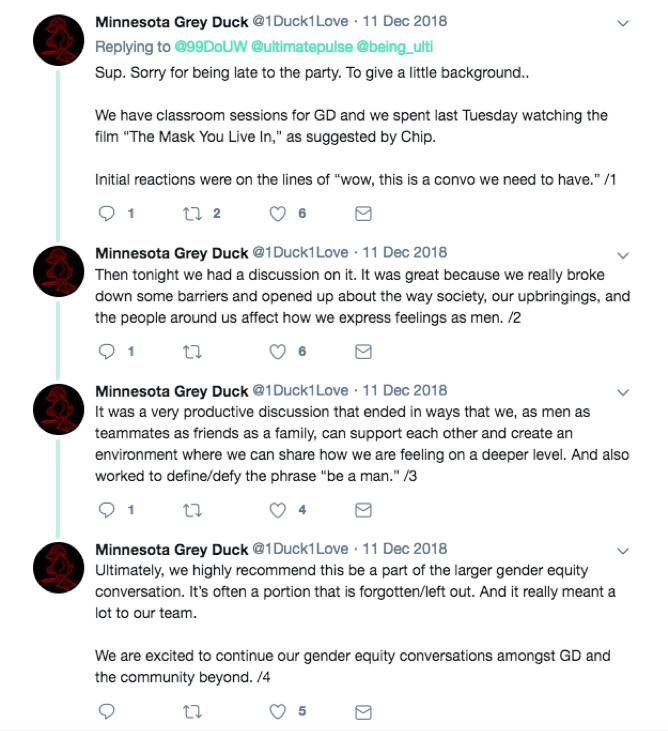 Through the 99 Days account Chip was not only able to offer advice and resources to Grace, but inspiration for other teams, such as Minnesota Grey Duck, the University of Minnesota men’s team, to share their experiences with having conversations concerning race and gender. The University of Minnesota Men’s team reports on its internal gender equity discussions and actions. Grey Duck’s willingness to express vulnerability and discuss masculinity emphasized the campaign’s ability to invite constructive dialogue from populations who aren’t often challenged to think critically about their social identities. In another week of 99 Days, Katie Douthat profiled coaches, captains, and players on new women’s club teams, a reminder to not only focus on ultimate’s most visible athletes. Shayna Parker used the account to generate discussion about gender neutral language and crowdsource suggestions for how teams can incorporate inclusive terminology on the field. Through all the unique stories and lessons shared, 99 Days has become a robust resource for those looking for ways to make their ultimate communities more welcoming and learn about—and celebrate—diverse experiences in sport. Despite the successes of 99 Days (which has more than five thousand combined followers on its three accounts), consuming social media and reading articles can only do so much to create change. As the first year of 99 Days winded down in 2016, the organizers saw a need to develop a second initiative so dialogue could continue in local communities and inspire action. In February of 2017 they launched 28 Days of Food, Frisbee, and Feminism, a more action-oriented, community-based campaign which begins its third year next month. Throughout February ultimate communities across the world are encouraged to host discussions and share their event on the 28 Days Facebook page so others can join the conversation. 28 Days events often begin with guided questions and conversation about social issues in the community and end by asking groups to identify and commit to action items (i.e. supporting women as leaders in mixed settings). While activities and discussion topics are provided on the Facebook page, the hosts of each event are encouraged to create an agenda with topics that feel most relevant to their community and attendees. In 2017, the female staff at USA Ultimate organized a lunch to talk about feminism in the workplace. In 2018, the Los Angeles Organization of Ultimate Teams (LAOUT) organized a 40-plus person event to generate gender equity discussion that would help LAOUT develop a statement of values and guide future decisions about league formats. That was the case at an event Douglas helped host in Northfield, MN for the ultimate teams at St. Olaf College and Carleton College. Though college athletes playing in the same small town share many experiences, with six teams, two colleges, and two divisions represented, there were many diverse opinions about the inequities present in the community and how best to address them. 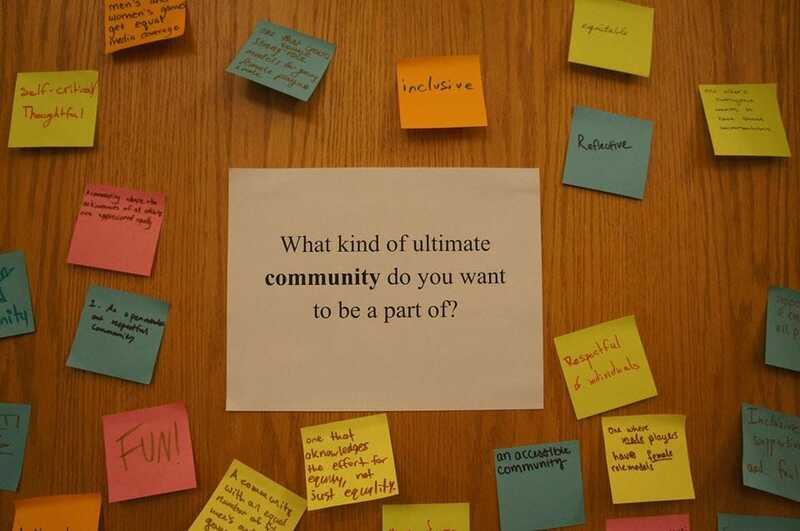 After time for both small and large group discussion, the night ended with groups identifying what their ideal ultimate community would look like and the actions they would need to take to make that vision a reality. 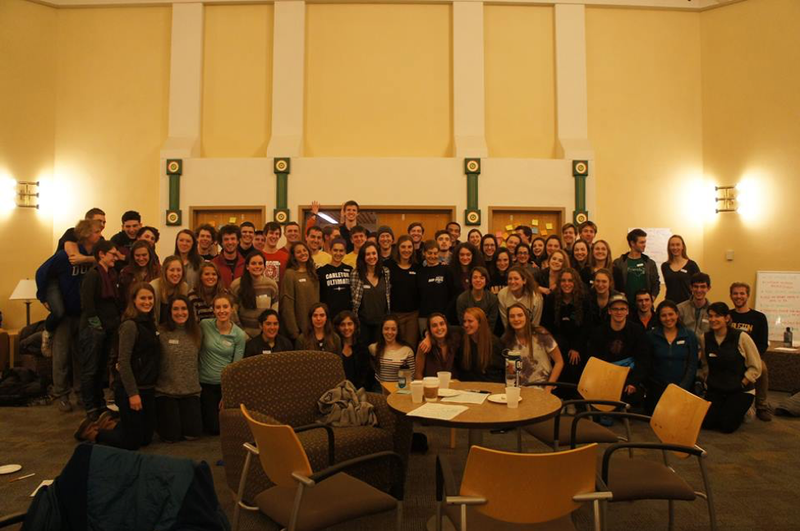 A joint St. Olaf and Carleton 28 Days Event in 2018. Photo provided by Tulsa Douglas. Whether you are newly gaining exposure to the topic of equity in ultimate or you think about it on a daily basis, joining a 28 Days event can help you become a better participant in your ultimate community and learn how to make that community better for others. If you are interested in participating this February, check out the Facebook page to find an event near you. If none exist, create and share your own event, or post in the page asking if someone is willing to host a discussion in your area. And whether or not you can attend an event in person, supporting and learning from both initiatives is easy—following 99 Days and 28 Days on Facebook and Twitter will provide access to countless resources about these topics, aiding you in your journey to celebrate and support all kinds of athletes, all 365 days of the year. Katie Ciaglo started playing ultimate in Colorado at Monarch High School before heading for the colder climes of Minnesota to attend Carleton College. At school she majored in English and played for and captained Carleton Syzygy. After graduation, Katie returned to Colorado where she now plays for Small Batch. Comments on "Two Initiatives Dig Into Gender Equity And Social Issues In Ultimate"